JESUS CAMP is a sarcastic documentary that paints evangelical, fundamentalist, charismatic, and politically concerned Christians as very shrill, warlike, and dangerous. The accusatorial movie actually shows, however, how these people are wiser, more enthusiastic, and more committed than other segments of society. 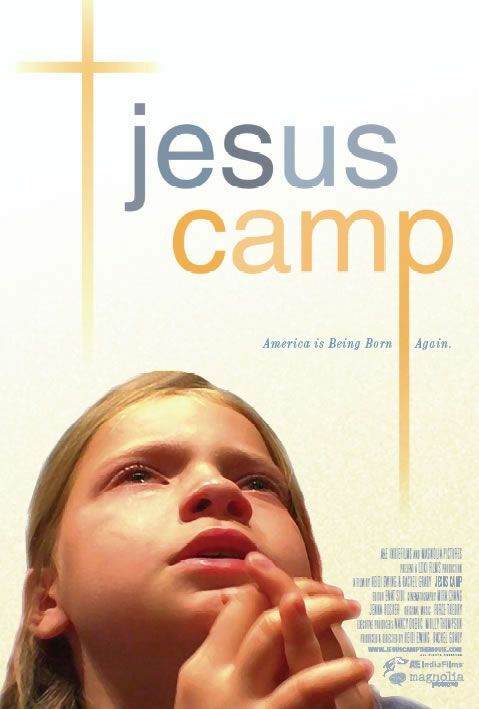 JESUS CAMP is a sarcastic documentary that paints evangelical, fundamentalist, charismatic, and politically concerned Christians as very shrill, warlike, and dangerous. It is a cutting edge, negative portrayal of committed, enthusiastic Christians. JESUS CAMP is a more subtle, sarcastic documentary version of the abhorrent movie SAVED. It does not merit a Minus Four because some viewers may be able to see past its sarcastic edge to the faithful representation of enthusiastic believing Christians. The all-woman production team opens the documentary with a view of the highways of America while friends of MOVIEGUIDE® such as Dr. D. James Kennedy, Dr. James Dobson and others discuss the culture wars in passionate terms. The movie then cuts to a self-proclaimed Christian radio talk show host named Mark Papantonio. Mark fields calls from people who say they have been Christians all their life but are very concerned about an evangelical, fundamentalist, and charismatic conspiratorial takeover of the United States of America. They believe that the fundamentalist Christians, as they wrongly call them, are secretly destroying the country. Next, we cut to an overweight, middle-aged Pentecostal pastor, Becky Fisher. Although she seems to be photographed in all the most negative ways, astute viewers of this documentary will realize that this woman is very intelligent and has figured out wonderful ways to reach children with the Gospel. The first shot of the children is a stage production where they are wearing camouflage makeup and singing about going off to war. It must be noted that the movie misrepresents all of these statements about war. It does not understand spiritual warfare, and it makes these children look like little Hitler Youth or young Islamic terrorists. Becky gets the children to talk about their faith. She helps to visualize the Gospel by scouring toy stores to look for things like brain molds where you can mold jello that looks like a brain and stick bad actions on there such as drinking, smoking and other things that could corrupt the brain. This woman is brilliant. She creates such striking visual images out of difficult topics that I’ll use some of her techniques. As a result, the children become very committed to their faith. They openly witness to others, and they pray for revival and reformation, and even for George Bush. The producers and Mark Papantonio think these prayers for George Bush are frightening. Evidently, they have never read the Bible because it calls us to pray for those in authority, whether it is George Bush, Bill Clinton, or anyone else. The documentary ends, and this is not a spoiler because this isn’t that kind of movie, at Ted Haggard’s church in Colorado. Ted Haggard is portrayed as a mean person whose comments are taken totally out of context. This sarcastic hatchet job may work with confused liberals who have never taken a minute to read any passages of the Bible. It may also confuse children and should not be seen by them. It may encourage, though, committed Christians who will understand that, in spite of the attempt to tar and feather people of faith, the movie actually shows how these people are wiser, more enthusiastic, and more committed than other segments of society. We should pray for Becky Fisher that she does not become discouraged, and for Ted Haggard. We also should pray for the team of women producers, writers and directors at Loki Productions. Of course, Loki was the Scandinavian, trickster god. And, we should pray for Mark Papantonio who doesn’t seem to realize that the wall of separation of church and state is a hypocritical liberal fiction that actually establishes its own civil religion. Mark claims to be a Christian. Let us pray that he be filled with God’s Holy Spirit and be delivered from the evil demons that have made him so hateful toward the Christian leaders of America. After all, Jesus came to set us free, which is good news for everyone. (AbAbAb, PCPCPC, CCC) Very edgy anti-Charismatic, anti-fundamentalists, anti-socially relevant Gospel with a radio host who attacks fundamentalists who claims to be a Christian, yet believes the Church should not influence politics and claims the right-wing church is a threat to mankind plus many positive statements about Jesus Christ, faith, salvation, and children who are on fire about Jesus; no foul language, but the deceptive false statement about the wall of separation between church and state; no violence, but children sing about going to war for Jesus Christ and other statements taken out of context to make viewers believe that these children are like Islamic warriors; and, mean spirited portrait of Pentecostal Christians. JESUS CAMP is a sarcastic documentary that paints evangelical, fundamentalist, charismatic, and politically concerned Christians as very shrill, warlike, and dangerous. The all-woman production team opens the documentary with a view of the highways of America while friends of MOVIEGUIDE® such as Dr. D. James Kennedy, Dr. James Dobson and others discuss the culture wars in passionate terms. The movie then cuts to a radio talk show host named Mark Papantonio. Mark fields calls from people who say they are Christians but are very concerned about an evangelical, fundamentalist, and charismatic conspiratorial takeover of the United States of America. Next, the movie focuses on middle-aged Pentecostal pastor, Becky Fisher, who teaches Christian children at a summer camp how to be committed to their faith. Finally, the movie ends by making Christian leader Ted Haggard look mean. JESUS CAMP goes out of its way to show Christians in a negative light, taking many statements out of context. The movie actually shows, however, how these people are wiser, more enthusiastic, and more committed than other segments of society. We should pray for Becky Fisher that she does not become discouraged, and for Ted Haggard.